Kia Soul fans rejoice! The Kia Soul, which was introduced to the market as a 2009 model, now has an optional turbocharged engine. The new Soul has a 1.6-litre turbocharged inline four engine paired with a seven-speed dual-clutch automatic transmission with manual shifting. The new turbocharged Kia Soul now develops 201 horsepower at 6,000 rpm and 195 lb-ft of torque at 1,500 rpm. The Soul will reach 100 kph in 7.5 seconds (est) from a standstill and will keep on going to a claimed top speed of 200 kph. 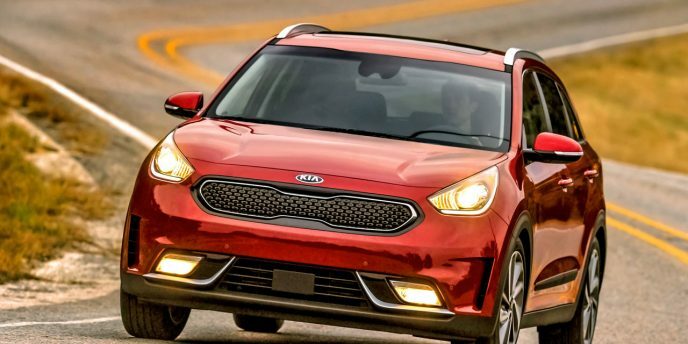 Interestingly the engine in the new Kia Soul Turbo is the same engine found in the Kia Forte Koup, Kia Optima, Hyundai Elantra Sport, Hyundai Sonata, Hyundai Tucson and the Hyundai Veloster Turbo. The Kia Soul sells extremely well in the small car, tall hatchbacks & crossover vehicle segment in Canada. In 2016 it led the market segment with 12,672 units sold. The closest competitor to the Kia Soul in this segment was the new Honda HR-V. In 2016 the Honda HR-V sold 12,371 units. 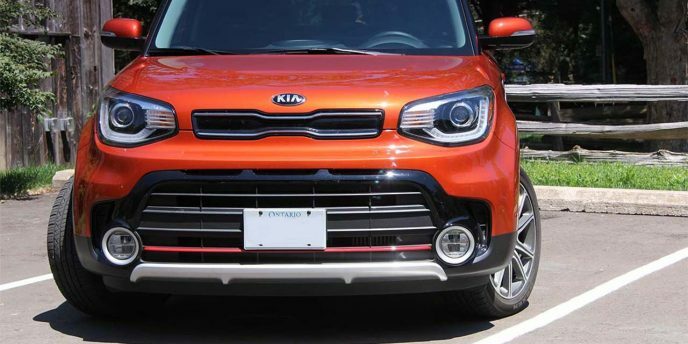 A VW GTI-esque red stripe nicely compliments the athletic looking Kia Soul Turbo. To distinguish the turbo model from the base model there have been several visual refinements. 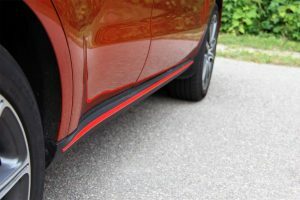 A Volkswagen GTI inspired red accent line just below the door runs along the rocker panel. The piano black grille is sharper and also sports a red accent line near the bottom of the fascia. Our test vehicle also included 18-inch sport alloy wheels with P235/45R18 tires, upgraded fog lights, dual exhaust tips, a front skid plate and distinguishing Turbo badges. The Wild Orange coloured stitching looks great on the sport shaped steering wheel and the sport seats. Inside, you will find comfortable, high quality black cloth sport seats with leather bolsters trimmed in “Wild Orange” stitching. Both front seats are six-way power adjustable and heated however, only the drivers’ seat has lumbar support. 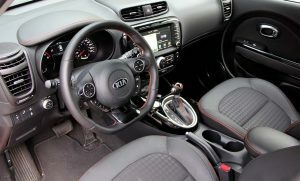 The Kia also has a heated sport steering wheel (shaped like a downwards facing “D”) wrapped in leather and also trimmed to match the seats. The automatic gearshift is wrapped in leather and accented nicely with more stitching and a black and orange plastic knob. 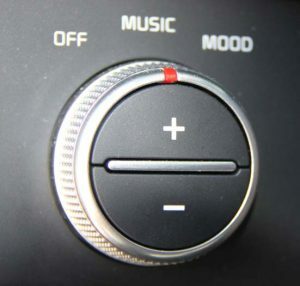 The control knob for the footwell lighting can be set to respond to the music or apparently even your mood. Underneath and to the left of the steering wheel there is a control knob for the foot well lighting which you can set to react to mood or music. It worked extremely well for music however stayed permanently blue while on mood, which I thought was weird because I couldn’t resist smiling the entire time. The tester also came with a beautiful panoramic sunroof that made the already spacious car feel even more so. Speaking of space, the cargo capacity for the Kia Soul Turbo is 532-litres which climbs to 1,402-litres once the rear seats go down. The trunk also comes with a clever hidden floor panel, which can be used to store valuables. The eight-inch multimedia interface comes with voice activated navigation, Android Auto and Apple CarPlay. 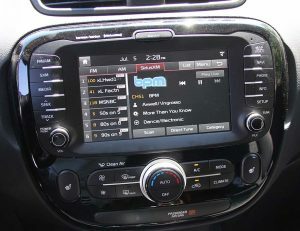 On the Soul Turbo the Tech package option adds $3,000 making the Kia $31,000. The option package includes dual USB charge points, eight speakers, Harman Kardon premium audio system, eight-inch multimedia interface with voice-activated navigation, Android Auto and Apple CarPlay smartphone integration, LED cabin lighting and a cargo cover with luggage net. 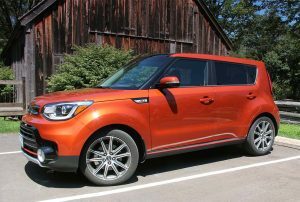 There is so a lot more to delve into when it comes to the Kia Soul Turbo so make sure to come back and read our full road test review. I’m excited to tell you what it’s been like to drive, how comfortable it is, its livability, the fuel efficiency and why it’s worth the extra money for the Turbo. With 6,856 Fortes down the road as of May 31, 2017 and 12,296 units sold during the entire 12 months of 2016, Kia seems to be on track for a record year. Of course, we’re only talking five months so far, with seven more that may not prove as profitable, but things are definitely moving up. It’s difficult for we outsiders to surmise where the sales growth is coming from. VW’s Jetta, Ford’s Focus, Dodge’s Dart, and Kia’s own Soul are having particularly bad years, so some of those who’ve previously bought these competitors may be switching rides, or more likely the Forte is finding a combination of many such conquest sales as well as managing to upsell would-be Rio buyers that haven’t been too keen on little subcompact lately. Now matter how we try to dissect it, Forte sales are up by a considerable margin. From personal experience of driving and reviewing five Fortes since introduced for 2010, I can honestly say it’s about time the market caught on to how good this compact model is. I can speak similarly for most of the brand’s current offerings, Kia a mainstream volume brand that delivers much more than its value-oriented pricing suggests, and backs up its entire line with one of the better warranties in the industry at five years or 100,000 kilometres. With respect to the car in our garage specifically, it’s a thoroughly refreshed second-generation Forte5 that somehow manages to look better than the already stylish outgoing version. I’ve long found the Forte an attractive compact, whether in 5-Door hatchback, four-door sedan, or two-door coupe guise. 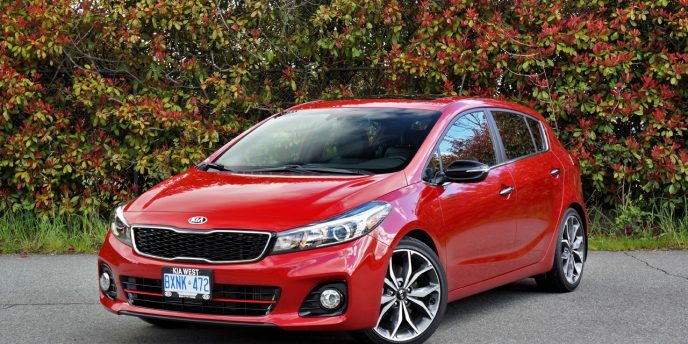 As you may have heard, the coupe, or rather Koup was discontinued at the end of 2016 in the U.S. and continues unchanged here in Canada, so you’ll need to step up to this Forte5 or the sedan in order to enjoy all the improvements. At my beck and call this week is the 2017 Forte5 in top-tier SX trim, which is exactly how I’d option this car out if my name were going on the ownership papers. The only issue I’m a bit stumped about is whether to leave its standard six-speed manual as is or upgrade to the seven-speed dual-clutch automated gearbox with paddles. I’m testing it in the latter trim and without giving too much away ahead of my full road test review, it’s damn good. Then again the manual is, well, a manual, which inherently provides more driver engagement. A tough choice, but of note one that most automakers don’t provide at all. Move up into the topmost trim levels of the Forte’s key rivals and you’ll be stuck with an autobox or worse, a CVT, but kudos to Kia, this sportiest Forte5 gets a true performance aficionado’s alternative, which has to warm the heart of anyone with petrol in the veins. If that wasn’t already the best part, take heed this sportiest Forte5 gets fitted with a zesty 201 horsepower 1.6-litre turbo four with 195 lb-ft of torque, which is a solid 37 horses and 35 lb-ft more than the already sufficiently potent base 2.0-litre four. I’ll go into more detail about how this little mill reacts to input in my review, not to mention explain how its driver selectable Normal, Eco or Sport modes work while delving into how its 18-inch alloys on 225/40s and sport-tuned MacPherson strut front and torsion beam rear suspension manages aggressive behaviour, plus explain how its 0.8-inch larger 11.8-inch front discs and 10.3-inch rears perform under pressure. The Forte5 SX comes swathed in some pretty upscale duds too, such as proximity-sensing access with pushbutton ignition, a flat-bottomed leather-wrapped tilt and telescopic multifunction sport steering wheel, a leather shift knob, alloy pedals, 7.0-inch colour touchscreen infotainment with a rearview camera, UVO eServices, Android Auto and Apple CarPlay, AM/FM/MP3/USB/aux and satellite audio, a soft-touch synthetic dash top and door uppers, leather upholstery, three-way heatable front seats, and much more. Another quandary would be whether or not to add on the $3,600 SX Premium Tech package, but if it were my money and the prospect of spending many a commute for three or so years lay ahead I’d probably take the plunge as the upgrade includes HID headlamps, a Supervision gauge cluster with a 4.2-inch colour TFT multi-information display, an auto-dimming rearview mirror, dual-zone auto climate control, three-way ventilated front seats, navigation with detailed mapping, voice activation, HD radio, a powered glass sunroof, unique red-accented sport seats (with the manual), a 10-way powered driver’s seat with two-way memory, plus blindspot monitoring with lane change assist and rear cross-traffic alert. As it is, Kia added this package and it’s making my weeklong test drive a lot more comfortable. How I love minivans! Well, maybe the love is about what I can get done when I’ve got a minivan at my beck and call, than actually loving minivans. Still, I think most will agree the Sedona goes about its practical business with a lot more style than most. It helps that Kia gave me a luxury-lined SXL+ model, which is outfitted about as nicely as anything in the class comes. OK, it’s not as tarted up as a full load Pacifica, but its as-tested $46,895 window sticker doesn’t shock the senses as much as the $58,480 2017 Pacifica Limited I put through its paces recently. I believe the Pacifica is worth the extra money, but this Sedona is also worth every penny and more. Kia’s minivan enters the 2017 model year with no new additions and one notable subtraction, the elimination of the SX trim line. Fortunately the new model doesn’t suffer from any lack of options, its available trims still including L, LX, LX+, SX+, SXL, and the SXL+ model currently in the garage. It’s an attractive van no matter the money spent, the Sedona’s long nose, bold grille, sporty fascia detailing, low profile, and wide, solid stance making it look more like a seven-passenger crossover SUV than anything van-like. Of course, the side sliders give away its pragmatic roots, but that’s about it. All of its trim lines featuring nice chromed exterior detailing, auto on/off projector headlamps, heatable body-coloured side mirrors with integrated turn signals, a rear rooftop spoiler, and more, while features like a tilt and telescopic multifunction steering wheel, powered front and second-row windows, display audio with satellite radio, a backup camera, Bluetooth, illuminated vanity mirrors, seating for seven, “Slide-n-Stow” second-row seats, and more come standard for just $27,995. A 276 horsepower direct-injection 3.3-litre V6 with 248 lb-ft of torque comes standard too, mated to a six-speed automatic with a Sportmatic sequential shifter, while optional Drive Mode Select offers Comfort, Eco and Normal modes. Base models get 17-inch rims, but my SXL received chrome-finished 19-inch alloys for a nicer look and better road holding, but like usual I’ll leave comments about driving dynamics to my upcoming review. Instead, some notable features that come with mid-range trims include HID headlights with auto-leveling and adaptive cornering, power-folding side mirrors, proximity access, pushbutton ignition, a leather-wrapped steering wheel, leather upholstery, eight-way powered front seats, driver’s seat memory, three-way heatable and cooled front seats, heatable second-row captain’s chairs, tri-zone auto HVAC, 8.0-inch infotainment with Android Auto, a 360-degree parking camera, navigation, front and rear parking sensors, second- and third-row sunshades, a hands-free powered liftgate, blindspot monitoring and more. The SXL includes stainless steel door scuff plates, an enhanced LCD/TFT Supervision primary instrument cluster, a dual-panel panoramic sunroof, dual 110-volt household-style power inverters in the console and cargo area, supple perforated Nappa leather upholstery, three-way ventilated front seats, second-row luxury captain’s chairs that slide back and forth as well as side-to-side (with kick-out extendable leg rests no less), plus front parking sensors, lane departure warning, and much more. Special SXL+ features include a larger 8.0-inch infotainment touchscreen with navigation, a 360-degree-surround parking camera, Infinity eight-speaker audio with an external amp and sub, auto high beams, adaptive cruise control, and autonomous emergency braking. 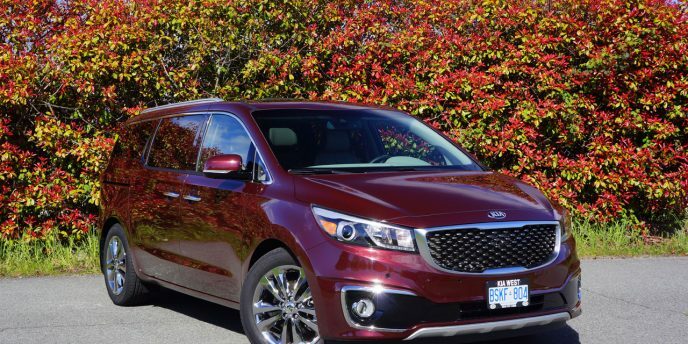 For decades, the Korean brand Kia was an enigma in the North American markets. During its early history, Kia supplied engines and transmissions to Ford for use in North American and European models. When I first married, I bought my then wife a 1988 Ford Festiva, a Kia-powered tiny affair. We drove the Festiva for 87,000 km with the only problem being a faulty driver-side, rear wheel bearing. The Festiva featured decent performance-it actually was fun to drive-and was roomy inside. I wish YouTube had been established in 1988, as watching me unfold my 6-foot-9, 300-pound body from the Festiva would've probably made for a viral hit. But I fit just fine inside the tiny car, and its reliability endeared me to the Kia brand. The Picanto has long been a great looking little city car that sells very well in global markets. Canadian world travelers that happen to love cars may have noticed them roaming the streets in Europe, Asia, or most anywhere else, although diehard automotive fans will likely be aware of the car's existence. Given its popularity elsewhere and our burgeoning small car market, wouldn't it make sense for Kia, a growing albeit still less popular brand, to offer it here? 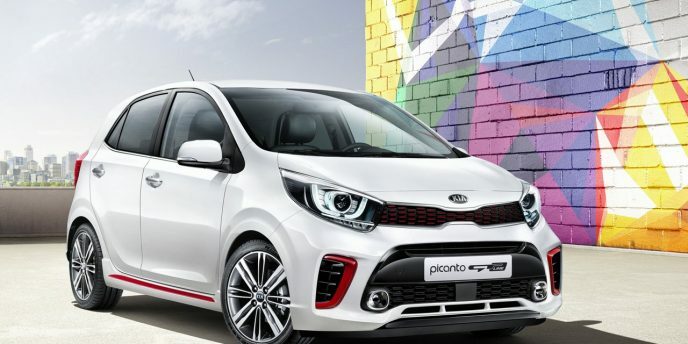 Kia has just released photos of its third-generation Picanto, a stylish little runabout that boasts a 15-mm longer wheelbase than its predecessor at 2,400 mm, and wheels that have been pushed farther out towards each corner for "a more confident appearance," says Kia. Along with more sculpted bodywork the new Picanto's exterior colour palette will be even more vibrant than previous generations, with 11 bright paint options designed to make passersby take notice.